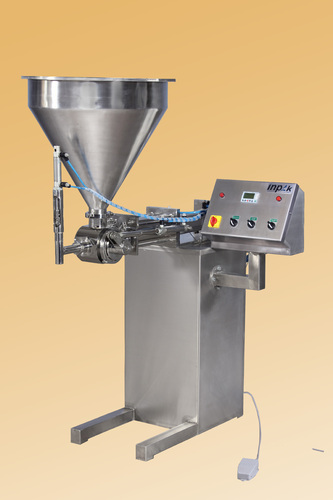 Pioneers in the industry, we are manufacturing and supplying an exclusive range of Idli Mavu Filling Machine. Easy to install and provide long-term service, the given filling machine is available in various specifications in accordance with our clients’ requirements. This filling machine is manufactured using premium quality components and leading techniques in conformity with set guidelines. Also, our customers can avail this filling machine from us after complete check. Input (Container Dia/ Height) 24 mm Dia to 100mm Dia/ Height 120 mm Max. Filling Accuracy ± 0.5 to 1% Filling accuracy on single dose Depends of the nature of Batter. Our organization, SS Automation & Packaging Machine, setup in year 2008, has been one of the famous manufacturers and exporters of Wrapping Filling Machines, Packing Machine, Flour Filling Machine and Band Selling Machine are some the highly recognized products from the wide range manufactured by us. The raw material for manufacturing the products is cautiously selected after proper checking of quality to ensure the best available products. The company has installed modern and currently upgraded technological equipments for guarantying performance efficiency in the products. The company also develops varied products according to the customization and specifications required by the consumer for complete satisfaction. We are manufacturing our products under the brand name Inpak. Over the years the company has build a loyal and dependable clientele base which appreciates the efforts and exclusivity of the products. The company attracts and develops close relations with the clients because of the low maintenance of the products, ability to be operated with any material and long lasting life at highly competitive rates.